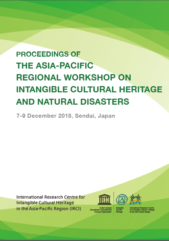 Proceedings of the Asia-Pacific Regional Workshop on Intangible Cultural Heritage and Natural Disasters(1) held during 7-9 December 2018 in Sendai, Japan is now available for download. The proceedings summarises the discussions over the three days, and compiles all the papers presented by the workshop participants. Check below for the table of contents and for downloading selected papers. *The entire volume is available for download if you click the cover image at the bottom.